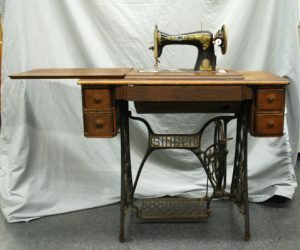 This object is a Singer Sewing Machine, it was made by the Singer Sewing Machine Company. Singer is an American company, founded by Isaac Merritt Singer and Edward Cabot Clark, that has been making sewing machines since 1851. 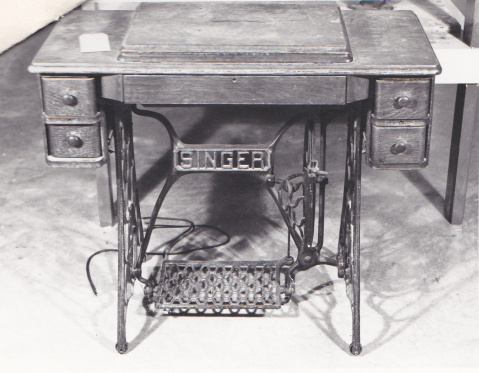 The Singer sewing machine was the first sewing machine that was designed for home use, rather than factory production. The first machine had the basic eye-needle and lockstitch that was patented by Elias Howe. The basic eye-needle, also known as the universal needle it has a rounded point and is used to sew on woven or knitted fabrics. The lockstitch is the most basic stitch that creates a straight line by interlocking two threads together one from the top and the other from the bottom. Isaac Singer was born October 27, 1811 the eighth son of poor German immigrants in Pittstown, New York. Isaac went to work as a mechanic and cabinetmaker when he was a young man. He designed his first invention when he was working for a manufacturing plant that made wooden type for printers. He created a machine that was better at carving the wooden type. It was in 1850 that Isaac saw a sewing machine being made and decided that he could make a better version of the machine. Violet’s daughter, Ailsa Trundle is working on a small sewing project beside her mother. Image from State Library of Queensland, via Wikimedia Commons. Askaroff, Alex. Isaac Singer. Sussex: Crows Nest Publications, 2014. Bausum, Dolores. Threading Time: A Cultural History of Threadwork. Fort Worth, Tex: TCU Press, 2001. Brandon, Ruth. Singer and the Sewing Machine: A Capitalist Romance. New York: Kodansha International, 1996. Carlson, Laurie M. Queen of Inventions: How the Sewing Machine Changed the World. Brookfield, Conn: Millbrook Press, 2003. Siegel, Beatrice. The Sewing Machine. New York: Walker, 1984.